This post is adapted from a 2014 post by Dr. Jacquelyn Gill (originally posted on The Contemplative Mammoth). Jacquelyn is overseeing the plant component of our ice age food webs. As a scientist, there are places I want to visit one day because they feature heavily into the intellectual mythology of my field: Darwin’s Down House, Mount Chimborazo, the Galapagos. At the top of the list, my scientific Mecca has been the fossil-rich Pleistocene tar pits at Rancho La Brea. I don’t remember when I first learned about this site, but I’ve wanted to see it for myself ever since I first learned of a place where thousands of ice age animals met their end, only to be studied by researchers millennia later. Early artists’ depictions like this, of an animal mired in a great lake of tar, are probably not what actually happened. The seeps were likely well-covered by dead leaves, and much more tricky to avoid. Via Wikipedia. I first had the opportunity to visit La Brea back in the spring of 2014, as part of a trip to give a talk at the Natural History Museum of LA County (run–don’t walk!– to the new dinosaur hall! ), and visit with Page Museum staff scientists to discuss research opportunities. The entire experience was eye-opening for me on multiple levels. For starters, the site was nothing like I expected. 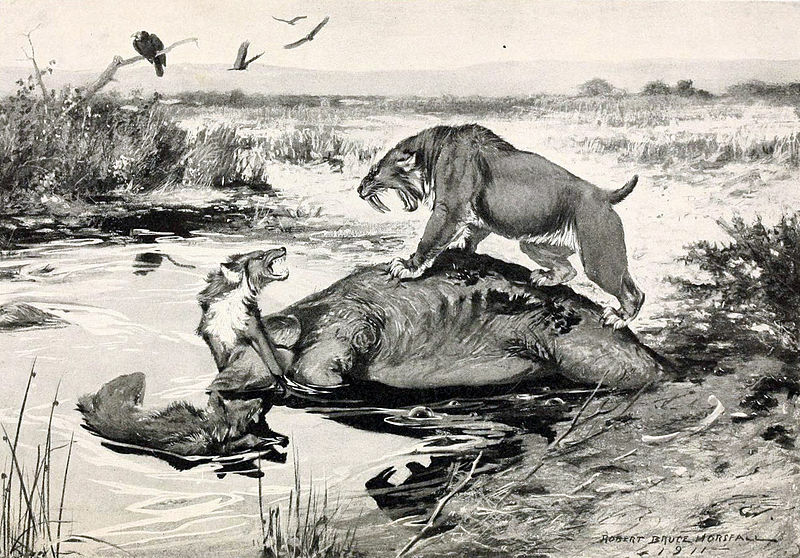 On some level, my mental image of the La Brea tar pits hadn’t changed since I was an elementary school kid: I pictured great lakes of bubbling tar, with bones occasionally dredging up to the surface, maybe. The reality — particularly for Pleistocene critters — was quite different. There is indeed a large pond at the front gates of the park, which does in fact bubble, and is complete with statues of a sinking mammoth and its distraught family members on the bank. This pond is largely man-made, though, filled with water after an early excavation. 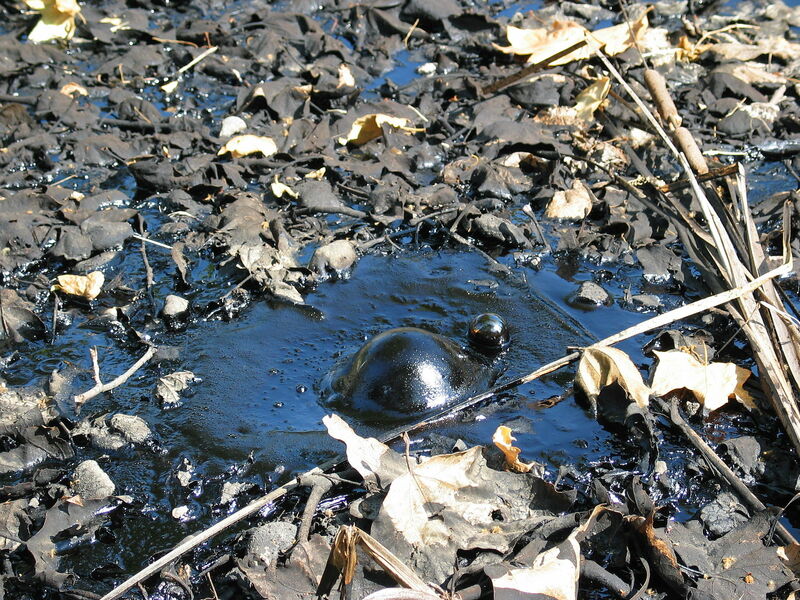 A tar bubble at La Brea, surrounded by dead leaves. It’s easy to see how an animal might have gotten mired in this. Photo by Daniel Schwen. I’d always wondered exactly how these animals could have gotten mired in a great bubbling pond of tar– it’s hard to imagine any critter willingly jumping in to the sticky, smelly goo (think the strong smell of laying down a new road). As you walk through the grounds at La Brea, you get a much clearer sense of what the environment was actually like. In fact, I found a newly formed “seep” on our way to one of the excavation sites! Just next to the sidewalk, I noticed a silver-dollar-sized bubble of tar in the grass, as though someone had squirted out asphalt from a caulking gun. My guide, Chief Curator John Harris, took one look and proudly announced, “that’s a new seep forming!” He explained that the spot would first get a bright green cone alerting visitors (he pointed one out further across the lawn, labeled “GOOEY”), and when the seep got big enough, it would be fenced off to keep people from falling in. My new tar pit will likely not be excavated, though, because there’s still so much coming out of the ground in the active pits. As we walked by some of the larger seeps, it was really easy to see how an unsuspecting animal would be easily trapped. 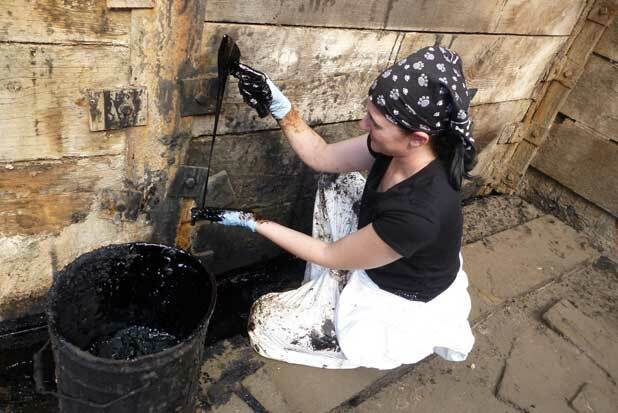 On a mild day (in the mid-70’s), the tar was just warming up enough to be sticky. The surface was covered with leaves, and was surrounded by grass. The only real indication that something was odd about a seep might be an occasional bubble forming, lazily blowing up and bursting and reforming in the afternoon sunlight. It’s easy to imagine an ice age bison wandering through, only to get its foreleg stuck in an open seep. Once that happens, it’s game over; even a few inches of wet, sticky tar is sufficient to prevent the animal from getting unstuck. The more it would move, the more firmly it would trap itself. 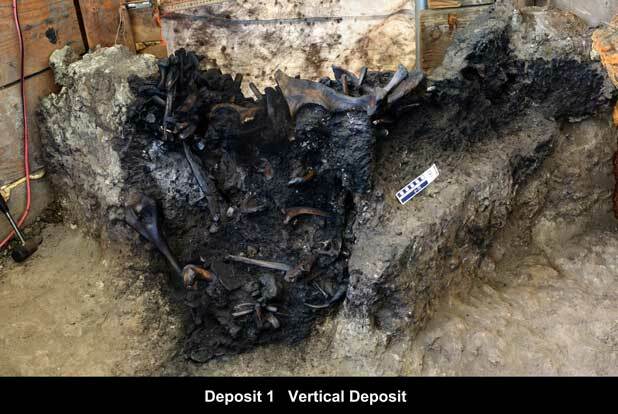 Bones being excavated from a tar pit chunk discovered when LACMA was building a new parking garage. You can see the black asphalt seep surrounded by rock and soil; the seep bubbles up from below. 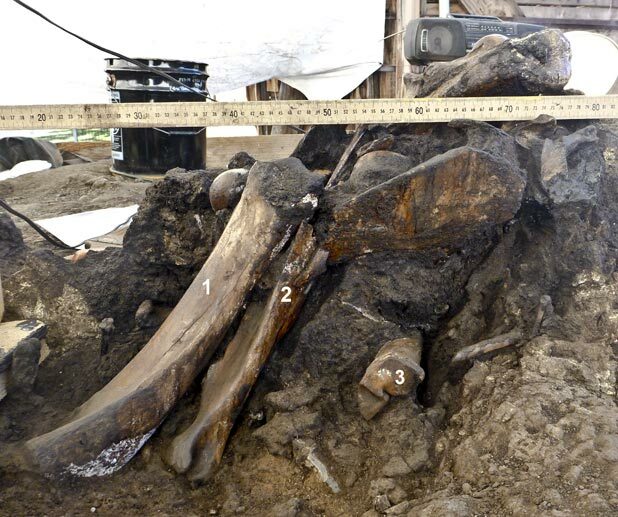 In the early days of La Brea, just the big bones were bing collected, like the bison tibia (1), broken scaupla (2), and left metacarpal (3) shown here. Today, the matrix surrounding the bones is carefully saved for later sifting, where museum staff will find insect, plant, and small mammal remains. Photo by the Page Museum. What happens next is actually part of what makes La Brea so fascinating: that bison, or mastodon, isn’t the only animal to fall prey. It attracts carnivores and scavengers, which see the trapped animal as easy prey. Easy, but dangerous; so far, scientists at La Brea have excavated more than 6,000 dire wolves and 4,000 saber-toothed cats. Predators are by far the most abundant specimens at the tar pits. Numbers matter: when you can sample in the thousands through time, you can do population-level studies of animals. You can assess how saber-toothed cats evolved due to climate change or major restructuring of the food web (say, when large animals go extinct). From work on tooth wear, we know that large carnivores were highly nutrient-stressed at the end of the last ice age, as megafaunal prey became scarce. The holy grail of La Brea would be to find ancient DNA in the remains, but the very asphalt that preserves these bones so well for tens of thousands of years also makes DNA preservation tricky. With the wealth of carnivore remains at La Brea, it’s understandable that most of the research attention and museum interpretation have thus far been on top predators. Early excavators focused on the large-bodied ice age animals, and weren’t terribly concerned about plants, insects, or small mammals. This mindset has totally changed in the most recent excavations. The museum has a lovely Pleistocene garden made up of plants we know grew in the region at different times, based on the seeds that are as well-preserved in the asphalt as the faunal remains. From the wood, we know that trees were carbon-starved when CO2 levels were lower than 200 ppm during the peak of the last ice age. A deposit excavated during the building of the LA County Museum of Art’s parking garage. You can see how the seep is a vertical slit in the soil, and the animals may have been trampled down into it or slid down during an earthquake. Photo by the Page Museum. Adding in insects, plants, and small mammals can provide a broader picture of Pleistocene ecosystems than is possible an almost any other place — especially when you consider how much time (as much as 100,000 years) La Brea represents. Seeps form and last 1,000-3,000 years on average, and so each deposit is a window into a vanished ecosystem. I can’t overstate how very cool this is from a scientific perspective: it’s incredibly rare to find so many parts of the food web represented in one place, and it’s why I’m so excited about our NSF-funded project at La Brea. The tar pits tell a story of climate change, extinction, and evolution that you just can’t get anywhere else. Which brings me to the second eye-opening aspect of La Brea: the Museum. My tour included a behind-the-scenes look at the collections. What you see at the Tar Pits Museum is only a tiny fraction of the material that’s been excavated at the tar pits in the last century. In the back rooms of the museum, you can find thousands of drawers full of fossil bones, everywhere you turn: thousands of saber-tooth skulls in one row, hundreds of ground sloth leg bones in the next. Interestingly, Harlan’s Ground Sloth makes up the bulk of the collection if you go by bones alone, because each of those giant, slow-moving herbivores had hundreds of round bones (osteoliths) beneath its skin, as a kind of armor against predators. Though they are ice age icons, there are relatively few mammoths and mastodon remains at La Brea, and most of them are young males (this is consistent with the fact that modern elephants are matriarchal, and pass on information about safe spaces to the herd — young males wouldn’t have had a guiding matriarch to help them avoid death traps). 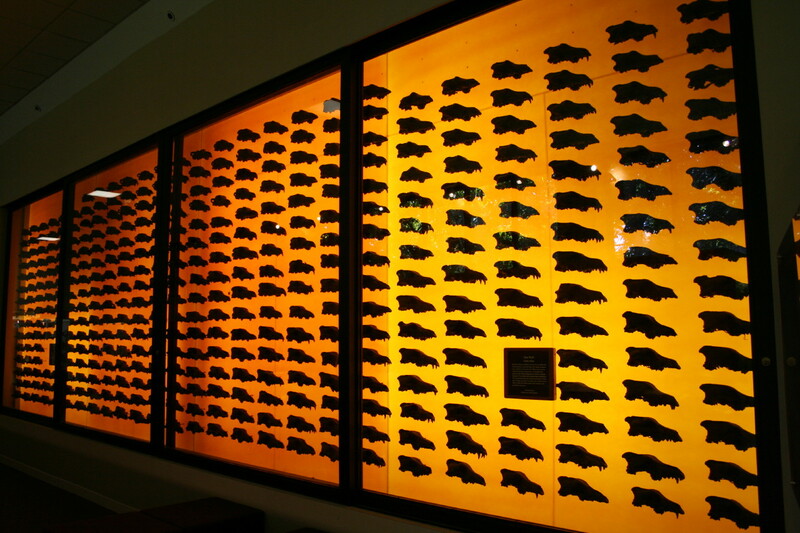 The famous wall of dire wolf skulls represents only a fraction of the more than 4,000 individuals in the museum. Photo by Pyry Matikainen. The collection itself is astonishing, but what’s even more amazing to me (as a scientist) is the fact that there’s so much research left to be done. In the case of the Tar Pits Museum staff, it’s all they can do at times to keep up with the volume of material being excavated– often, the research is left to visiting scientists. The folks at the museum were eager to discuss research opportunities, particularly in terms of bringing the plants and smaller animals into the broader picture. We had a great discussion over lunch about why so few people seem to realize that these materials are available to outside scientists to study; I thought it was perhaps because in academia, people are often pretty territorial about research sites. It would never have occurred to me, not having museum experience, that these materials were not only available, but in many cases were in dire (pun unintended) need of being studied. Working in the tar pits comes with unique challenges! Photo by the Page Museum. If you have a change to visit the tar pits, I highly recommend it– not only for the mind-blowing Dire Wolf Skull Wall (only 10% of the collection!) but for a chance to see the newly reopened Observation Pit and the active excavation at Pit 91. You can see science in action: more than 100 years after the first fossils were excavated at the site, it remains an incredibly productive site. As our methods have expanded, so, too has the story we can tell about the ever-changing past. It’s one of extinction and the consequences of climate change, but also of survival, adaptation and resilience, too. Our #LaBreaWebs team is excited to put together the ice age food webs at this exciting, important site — stay tuned for updates on our research!